Over the last 7 days, the Greater New York Red Cross provided emergency assistance to 82 adults and 32 children following 50 local disasters. Here are some highlights from last week and a preview of upcoming activities (see below). There was plenty going on this weekend across Greater New York Region. First up on Saturday, Metro New York North volunteers were honored at the annual Volunteer Awards and Recognition Ceremony. The event took place at the Centennial Golf Club in Carmel, N.Y.
On the same day out in Huntington, N.Y., Long Island Red Cross volunteers installed over 200 free smoke alarms to help make the community safer. The Staten Island Advance published an article highlighting the importance of fire safety and the #GetAlarmedNYC program just before Daylight Savings Time. “Springing forward” should serve as a reminder for us all to test our smoke alarms. Also over the weekend, Red Crossers Stephen Johnson and Orlando Villa represented the Red Cross at a recruitment fair at MLK High School alongside our partners from the Urban Assembly High School for Emergency Management. On Friday, we couldn’t let ‪#‎AmeriCorpsWeek end without a shout out to all of the great ‎AmeriCorps members who support the Red Cross mission across the Greater New York Region. We also hosted a small discussion to hear how ‪AmeriCorps works and learn about all of the service opportunities the program can provide. Last Thursday, FDNY, the Mayor’s Community Affairs Unit, Senator Martin Malave Dilan and Congressman Stephen Levin hosted a Fire Safety event in ‎Brooklyn where the Red Cross shared information about the #GetAlarmedNYC program and how residents can have free smoke alarms installed. On Wednesday Suzan Kereere, Greater New York Board Member, and Michael Wojcik, Sr, Director of Development, Strategic Partnerships, NE Division, received the American Red Cross Presidential Award for Excellence at a ceremony in Washington, D.C. 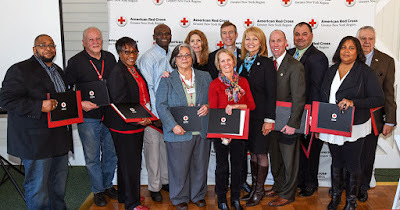 The honor recognized their service to the Red Cross. Mar 15: ABC7 will begin airing a Public Service Announcement they produced to promote the #GetAlarmedNYC fire safety program. Mar 16, 18: Red Cross blood drive: 1 to 7pm: 520 West 49th Street, Manhattan. Schedule an appointment to donate today. 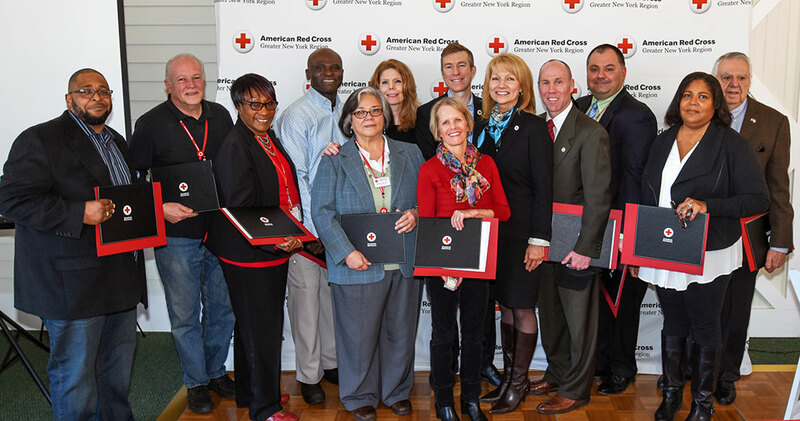 Mar 16: March is Red Cross Month and we’ll be honoring our volunteers throughout the region with Recognition and Awards ceremonies. The last one is being held in Greater New York on Wednesday. Mar 19: The #GetAlarmedNYC program is coming to Port Richmond, Staten Island. Volunteer or sign up for a free smoke alarm installation at www.redcross.org/GetAlarmedNYC. Apr 1-3: The Greater New York Red Cross is holding a 3-day Disaster Response Institute next month. Click here for more information on the event. Apr 2: Next month, Metro New York North will be holding its annual Red & White fundraising ball. It promises to be a great time! You can find out more here.